Is it cold where you are right now? It suddenly and relentlessly got cold here, so I am dreaming of the tropics. 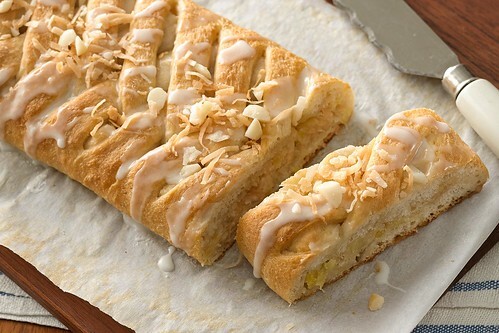 Cindy Nerat of Menominee, Michigan must have heard me, because she came up with this dreamy glazed Hawaiian bread as her entry to the Pillsbury Bake-Off. Sounds like a getaway breakfast is in order! Heat oven to 350°F. Line large cookie sheet with parchment paper. In small bowl, mix 1/4 cup of the coconut and 2 tablespoons of the macadamia nuts; set aside. In medium bowl, mix mascarpone cheese, 1/2 cup of the powdered sugar and the orange extract until well blended. Stir in pineapple, remaining 1/2 cup coconut and remaining macadamia nuts. Carefully unroll dough on work surface; press to form 12x10-inch rectangle. Fold dough rectangle into thirds; transfer to cookie sheet. Unfold dough rectangle. Spread mascarpone mixture down center of dough in 4-inch-wide strip to within 1/2 inch of short ends. Using kitchen scissors or sharp knife, make cuts 1 inch apart on long sides of dough to within 1/2 inch of filling. Fold strips of dough diagonally over filling, alternating from side to side, stretching dough as needed. Bake 22 to 32 minutes or until tops of strips are golden brown. Cool about 10 minutes. Meanwhile, in small bowl, mix remaining 1/2 cup powdered sugar and 4 to 5 teaspoons of the reserved pineapple juice until smooth and thin enough to drizzle. Drizzle glaze over braid; sprinkle with reserved coconut mixture. Serve warm.